My boys have been with SCMA for the past 9 years and they have loved every minute. From Little Dragons, where they play games whilst learning fundamental skills like listening, discipline, balance and team work, to Juniors where you see them develop self-confidence, respect and self-defence. 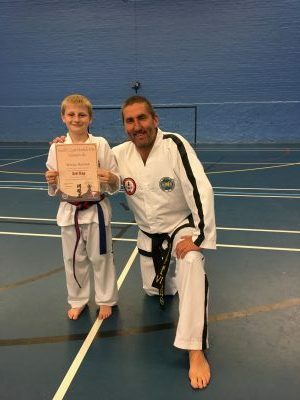 I cannot praise SCMA enough for the support they have given my boys and would recommend any parent who wants their child to succeed in life to seriously consider a martial art as a hobby. Our family has been training with SCMA since 2003. Our 3 boys were little and my husband and I joined too, not wanting to just sit on the benches and watch – it looked too good to miss out! We went through all the grades and finally, all got our Black Belts. Our oldest son is working towards his 4th Dan, and we are working towards our 3rd Dans. It is Challenging to remember all the patterns, and we feel that it is really good for our brains as well as our bodies. The best part is that we train together. My husband and I have lots of fun, especially when we are sparring! I would highly recommend to anyone to join. Not only is it a good work out, but you learn how to defend yourself! SCMA are very good and go out of their way to help you in any way they can. Over the last 5 years at SCMA, I’ve gained skills, fitness and lots of friends, but most importantly for me, I’ve gained confidence. I walked into that first session with the lowest self esteem a person could have, and I left the session today with a black belt, knowing that I’ve pushed myself harder than my 13-year-old self ever thought I could. Thank you so much to everyone at South Coast Martial Arts for effectively helping me become who I am today. My children joined the club as Little Dragons (4-6 years) and had a wonderful time with great instructors. They became more co-ordinated and self confident. They are now juniors and working their way up the belts. The club has been brilliant with them, the ethos is supportive. The outside activities like the camps, Christmas parties, bowling, fast defence and Moors & BBQ training are fun and help the children grow in confidence and make great friends. The club uses a variety of different instructors which suit different styles of learning. Parents are encouraged to be part of the club, either through supporting their child or by joining in. 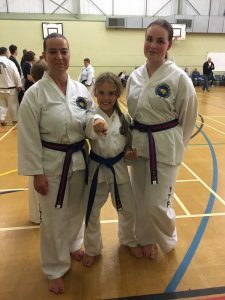 I have recommended SCMA to lots of people because it has been really positive for my children to do TaekwonDo, it is teaching them self respect, discipline, confidence, healthy mind & body, and a life skill that they can use for a very long time. My son has being coming to Little Dragons for just over a year now. He really enjoys the sessions and is always eager to learn either new moves or a little more on their current topic, his favourite topic so far is the emergency services. He was always quite quiet but being at Little Dragons he has flourished and is now much more confident in trying new things and making new friends. The Instructors are brilliant with the children always going the extra mile to help during class or organising extra activities outside of training sessions. For a year I sat and watched my 10 year old grow in confidence taking part in Taekwondo. It suddenly dawned on me that I too could be getting fit and take part. Well….. I’ve never looked back! I never in a million years thought I’d be any good and my confidence and self belief has grown massively. The whole SCMA family is so supportive and I can’t thank my instructors Mr Wood, Mrs Young and Mr Toghill enough – they truly have encouraged me to achieve what I thought was never possible, so if like me you are doubting yourself give this a try you won’t be disappointed. Fun, family fitness that comes with so many rewards …. love it !